The filing deadline for Democratic and Republican candidates passed last week. As part of our coverage of 2019 local elections, the Political Report previews some issues that they will face. Independents have until June 4 to file nominating petitions; June 4 is also the day of the Democratic and Republican primaries. Jail conditions: In a majority of New Jersey counties, the responsibility of running the local jail lies not with the sheriff but with correctional director appointed by other county officials; that is for instance the case in Hudson County, one of the state’s most populous jurisdictions. 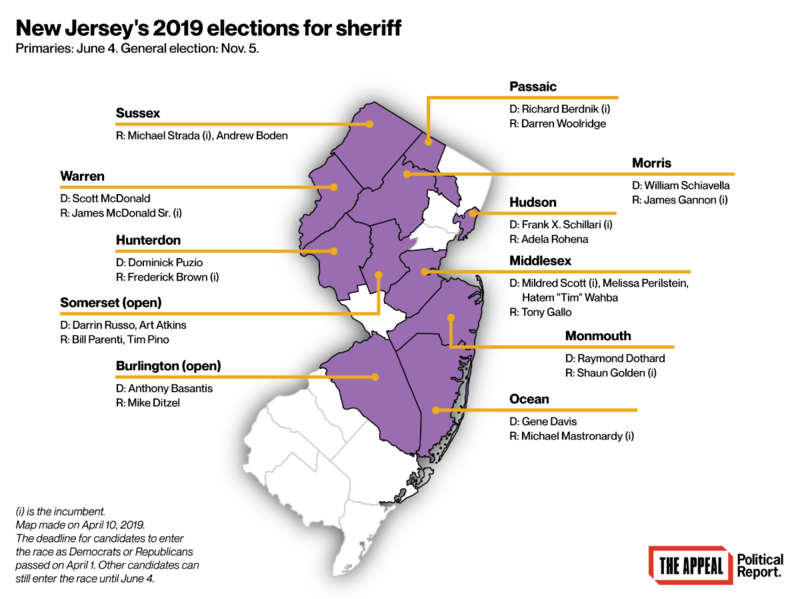 However, sheriffs do run the jail and therefore shape detention conditions in five of the counties voting for sheriff this year: Monmouth, Morris, Passaic, Somerset, and Sussex. Three New Jersey sheriffs have joined 287(g). Only one is up for re-election this year: Golden, the Republican incumbent in Monmouth. Raymond Dothard, his Democratic challenger, did not respond to an inquiry into his position on the contract. Other sheriffs who run jails could apply for new 287(g) contracts. They could also seek other forms of partnerships, such as renting jail space to ICE. Some of the sheriffs running for re-election this year have defended ICE cooperation. There is Golden, who participates in 287(g). In Morris County, Gannon has opposed efforts on behalf of local sanctuary reforms. And in Hunterdon County, Sheriff Frederick Brown has championed President Trump’s immigration policies and echoed the president’s rhetoric, blaming “uncontrolled, illegal immigrants” for wage losses, the opioid crisis, and murders. Johanna Calle, director of the New Jersey Alliance for Immigrant Justice, believes that all candidates should address whether they “think there is a role for sheriffs and local law enforcement to support federal enforcement,” and whether they would be open to entering new partnerships that ICE may come up with. “It has to do with values,” she said. A year into President Trump’s presidency, Sheriff Patrick Russo decided to dial up immigration enforcement in Rensselaer County. He joined ICE’s 287(g) program, which authorizes local officers to research the status of people held at the county jail and transfer them to ICE. Rensselaer is now the only New York county in this program. Russo then wrote in a local op-ed that he did not organize a forum on this because his “experience with public forums is that they become a platform for protests.” He also traveled to the White House for an immigration event with Trump. Immigrant rights groups have targeted 287(g) nationwide. Officials in three populous Maryland and North Carolina counties lost re-election bids in 2018 in contests shaped by their decision to participate in 287(g). All three counties have since left the program. But the prospect of Rensselaer County repeating that pattern dropped precipitously last week. Russo is up for re-election this year, but no one filed to challenge the Republican by last week’s deadline. This swing county voted twice for President Barack Obama and then for Trump. Russo, unopposed in his bid for a second four-year term, told the press this week that he intends to renew his county’s 287(g) agreement when it expires in June. This series of events reflects an environment in which state and national party structures do not pay sufficient attention to local elections that are decisive for issues that are integral to the national discourse, such as ICE’s power. Presidential contenders, a few of whom have outlined platforms on immigration, attract immense attention, but their election is still a year away. Sheriff’s races will decide the scope of ICE’s reach in hundreds of counties this year. “It is curious that the Democratic Party in Rensselaer County couldn’t be bothered to run anyone against a sheriff who has clearly become an outlier,” Siobhan Burke, an organizer with ICE-Free Capital District and the Troy Sanctuary Campaign, told me. Still, what paths remain for a change to Rensselaer’s immigration policies? The door remains ajar for candidates critical of 287(g) to emerge, but this now requires more acrobatics. In addition, the legislature could act to bar 287(g) within the state. You can read the rest of this Political Report article on cooperation with ICE in New York State here. Queens, New York: Aaron Morrison reports in The Appeal on the harsh practices that Queens District Attorney Richard Brown’s office pursues toward people on probation and parole. He talked to the six candidates running to replace him about what changes they would implement. Arlington County and Falls Church, Virginia: A marquee election this year is the June Democratic primary between Commonwealth’s Attorney Theo Stamos and Parisa Dehghani-Tafti, the legal director of the Mid-Atlantic Innocence Project. I interviewed Dehghani-Tafti in February about how she would target mass incarceration. Last week, the two candidates met in a debate, and the blog Blue Virginia published thematized videos corresponding to the debate’s issue segments, including the death penalty, diversion, and racial profiling. This format makes for unusually transparent contrasts by the standards of prosecutorial races. Arkansas: Governor Asa Hutchinson has signed into law a bill that shrouds the state’s death penalty process in secrecy and makes it a felony to “recklessly” identify the makers of drugs used for an execution, as the Daily Appeal has reported. Connecticut: Making a 15-minute call from a Connecticut prison costs $3.65, an expense that compounds the isolation of incarcerated people. Rachel Cohen reports for The Intercept on House Bill 6714, which would make calls from prison free. Some local jurisdictions have taken similar steps, either for all people (New York City) or for minors. The Joint Committee on Judiciary held a hearing in March, but held no vote. Iowa: Iowa will most likely take no action on expanding voting rights this year. It is one of just three states with laws that permanently disenfranchise anyone convicted of a felony. In March, the House overwhelmingly passed a constitutional amendment to restore the voting rights of people who complete a felony conviction. But Republican Senator Brad Zaun, chairperson of the Senate Judiciary Committee, decided last week to sideline the bill; Kira Lerner earlier reported in The Appeal on Zaun’s efforts to dilute the reform. Although Governor Kim Reynolds championed the constitutional amendment, on Friday she said she would not use her executive authority to enfranchise people with completed sentences. As a result, people will still need to file individual pleas for clemency—and Reynolds has only restored the rights of 88 people in this way during her first two years in office—though she eased the application process this year. South Dakota: Attorney General Jason Ravnsborg mounted a strong but ultimately failed push this year to reverse the 2013 reform with which South Dakota created a presumption of probation for offenses in the two lowest felony classes. People can now only be sentenced to prison if a court identifies circumstances that it says make them a threat. The Urban Institute found two years later that this was helping decrease prison admissions and it proposed further reforms, such as expanding presumptive probation to more offenses. But this year Ravnsborg faulted presumptive probation as too lenient and harmful to deterrence. He championed legislation to repeal it and expand judges’ ability to send people to prison. The state’s prosecutors and sheriffs associations each endorsed the bill, but the Department of Corrections argued that incarcerating more people was unviable and too expensive. The bill died in February when the Senate voted against it. The debate is not settled, however: Ravnsborg said he intends to push for repealing presumptive probation again next year. Virginia and Montana: Hundreds of thousands of Virginians can regain their driver’s licenses in July. The legislature voted to end their automatic suspension over unpaid fines and fees. Such suspensions trigger further economic and legal hardships for people whose licenses are suspended. (Last week, the Political Report wrote on reform efforts in North Carolina.) But the Associated Press reports that Virginia’s reform expires next year unless it is renewed because it was adopted as a budget amendment. A similar reform stalled in Montana when the Senate Judiciary Committee tabled a bill that had passed the House by a large majority in March. Bills are still pending in Illinois and Minnesota.